Description: Enchanting southwestern styling and an intriguing Native American design reveal the magic and mystery of tribal symbols in stunning art glass and matching hardware. 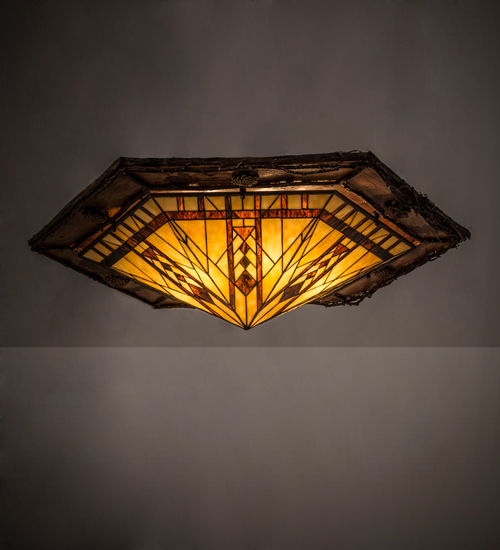 The hexagonal lighting fixture shade features a Sand Beige and Bark Brown granite glass shade which is created with the famous Meyda Tiffany copper foil construction. The shade embraces a wooden medallion frame that is flush-mounted to the ceiling. Handcrafted by highly skilled artisans in our 180,000 square foot manufacturing facility at the foothills of the Adirondack Mountains. Custom styles, colors, and sizes available, as well as dimmable energy efficient lamping options. The 36-inch wide fixture is UL and cUL listed for dry and damp locations.